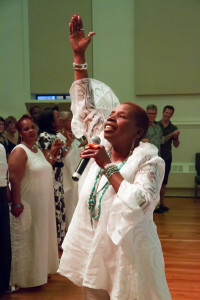 This content was originally from an interview iFred founder Kathryn Goetzke conducted with Iyanla Vanzant for her book “Peace from Broken Pieces” and has been reedited for this post. Vanzant is the host of “Iyanla: Fix My Life,” the #1 reality show on the OWN network, produced by Harpo Studios. She is an accomplished New York Times bestselling author, inspirational speaker, talk show host and living testament to the value of acting on faith. Iyanla goes deep inside people’s lives for emotionally, riveting conversations where she applies spiritual practices to bring forth inner peace and healing. I found it [the interview] an extraordinarily honest account of human pain and suffering, and the beautiful healing and elasticity of the spirit. Dr. Vanzant’s frankness about situational depression is an inspiration to others, and her ability to bridge the gap between the spiritual and medical community is definitely something all need to hear. I hope you enjoy it as much as I valued speaking to her. Have you ever personally been affected by depression? Would you share how? I experienced situational depression when I lost my daughter and also went through a postpartum depression, again situational from the change in hormones after her birth. How do you define depression? Depression is a manifestation of the belief, experience, thought, and belief that you are separated from God. This is not to say that there aren’t biological issues to be addressed. There are often imbalances that need medication intervention. We need to get the brain back to equilibrium so it can connect to spirit. How can we address cultural and societal perceptions of depression? We need to go to the spiritual leaders and educate them on the biological aspect of depression…as well as women’s groups and organizations. Depression can be both a spiritual emergency AND a medical / physiological issue. If you don’t treat the whole patient, including the imbalances in the brain, it can make it very difficult to heal. As a spiritual leader, what are your thoughts on medication? I have no problem with medications to rebalance the brain. You absolutely should get pharmaceutical assistance if your hormones and neurotransmitters are out of balance. When you are thinking with a diseased mind, you have to fix that first. Any advice for others on getting through depression successfully and finding HOPE? Along with biological intervention, you need to have a spiritual community. The higher self needs to be involved in the healing. You need community support, friends, and medical doctors. Culture is critical to healing from depression. You have to be surrounded by people who give you space to breath, and support you in keeping to reality. The women that were around me understood me, and doctors knew I had to bring myself back into alignment. The earth sustained me. Without a cultural support system, you cannot heal. Could you provide a Message of Hope for those living with depression?